Join us at the Coconut Grove Arts Festival Gallery for our annual holiday celebration featuring live music by Grove favorites, Campo Deluxe, and Acapella carolling by the Miamians. 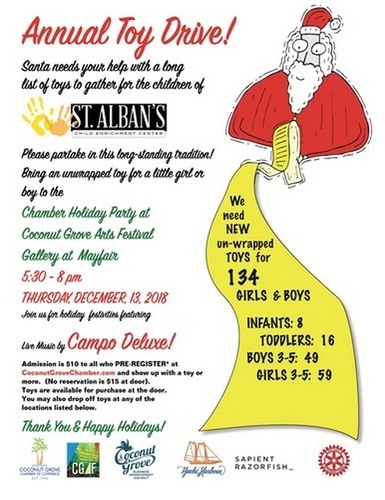 Bring an unwrapped toy for for our Annual Toy Drive for St. Alban's Child Enrichment Center in Coconut Grove. We need to help Santa fulfill 134 little wishes this year! (8 infants, 15 toddlers plus 49 boys aged 3-5 and 59 girls aged 3-5) There will be toys available for purchase at door, but supply is limited so please plan ahead to bring one. Note: in a tradition of Holiday Giving, the cost of admission for everyone who pre-registers for this event is $10. Price at the door $15.